PETITE PEAR STYLE: August 2013 SeasonsBox - Review and Giveaway! August 2013 SeasonsBox - Review and Giveaway! I am enjoying the products in this month's SeasonsBox, but the contents didn't really wow me. SeasonsBox has changed ownership yet again, and the new owners seem more engaging and communicative, so I am hoping the quality and customer service will improve. Here is a photo of the outer shipping box... I'm not a huge fan of the design. It seems as though SeasonsBox has switched back to the crinkle paper - this is definitely better than the crumpled up craft paper from last month! 1. Our tea is GREEN tea. Black and oolong teas have been intentionally oxidized which reduces their nutritional potency. 2. Our green tea has been picked by HAND. Machine-picking breaks and damages the leaves which causes degradation in their quality. 3. We offer our edible green tea in WHOLE LEAF form. Broken leaves and tea dust has lost much of its nutritional goodness. 4. Our edible Green Tea is 100% USDA Certified Organic. This ensures that pesticides, herbicides, and toxic fertilizers have not been applied to the plant. And more importantly are not finding their way into your body. 5. Finally, our Green Tea has been tested for levels of heavy metals (very toxic to the body). Even if a farm is certified organic, these highly toxic destructive can still be present in dangerous levels due to nearby industry, previous pollution of the area, or other factors. Our edible green tea has been lab tested for purity and antioxidant potency. 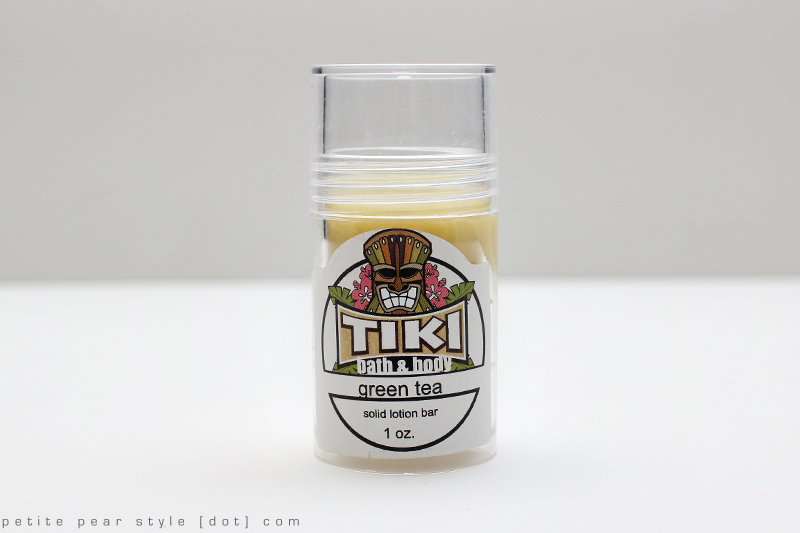 Tiki is a company based in Alabama that specializes in palm oil free vegan bath and body products. I really like the scent of this product - the green tea and spearmint combination is very refreshing. I was excited to receive this product because I had never tried a lotion bar before and it seemed like a neat concept. You push the stick up from the bottom to get more product out. I like this product for my knees, elbows, and feet (especially on the heels)... not so much on my hands, because I find the formulation a little oily and waxy. At first, I was not too excited about this product because I've picked up a lot of these types of bottles for free and I've donated or tossed every last one of them...t he quality just wasn't very good. I was surprised when I read great reviews about this brand! I like that we received a two-pack so I could use one and my hubby could use the other. I've tried mine already (I'm using the white one), and I really like it. It holds 400 ml of water, stands upright when it contains water, and folds up nicely when it is empty. I've tried using the pop top (similar to the top of a dish washing liquid bottle), and it's really easy to squirt the water into your mouth... I was worried it would get everywhere haha. You can also unscrew the cap and drink from the anti-bottle that way. The anti-bottle has a little carabiner-style fastener so you can attach it to your bag (or to your pants I guess), and a space to write your name (hehe). I think it's neat that you can also use these as ice packs! For some reason, I received 2 boxes from SeasonsBox this month so I will be giving one away! The contents are exactly the same as mine except the body oil is in guava fig and the anti-bottles are red. The value of the box the August SeasonsBox was $52.99. 1) Giveaway is open to residents of Canada and the U.S. You must have a Canadian or U.S. mailing address for me to send the prize to you. 2) You must be 18 years of age or older or have parental permission to enter. 3) All entries will be validated. Any ineligible entries will be deleted. 4) Winner will be selected on September 29, 2013. 5) Winner will have 72 hours to claim the prize before another name is selected. If you are interested, please enter the giveaway via the Rafflecopter widget below. You can gain multiple entries if you follow me on other types of social media - all the different ways to gain additional entries are also shown below. Good luck! SeasonsBox is a subscription service that promises 3-5 full-size luxury products for your home, body, and spirit. The box now ships out of Atlanta, Georgia and it looks like it is only accepting new subscriptions from U.S. residents. Besides curating boxes themed with a particular season (i.e., winter, spring, summer, fall), SeasonsBox also curates boxes themed with specific holidays (e.g., Valentine's Day, Mother's Day, Halloween). The contents of every box are intended to stimulate your senses with the scents and flavours associated with a season or holiday. SeasonsBox provides high quality, luxury, and full-size products (versus samples) with a focus on natural and responsible products. The products are also sourced from various places around the world and most of them are not available in commercial stores. SeasonsBox provides a preview of the products at the beginning of the month. Please visit the SeasonsBox website for current pricing. Note: I purchased a one year subscription to SeasonsBox with my own money. My favorite thing about summer is the fresh, in-season fruit that is available. Yum! My favouriate thing about the summer is the warm weather on a warm and sunny day at the beach. my favorite thing about summer is definitely flip flop:)! my favourite thing about summer is the weather and barbecues! My favourite thing is getting to wear summer dresses. my favorite thing is the warm weather & reading in the sun with an iced tea in hand! I love taking my daughter to the park and having a picnic, those are my best memories of summer. My favorite thing about summer is all the great in-season fruit that's available! I love eating outside. That's so uniquely summer to me and I miss it so much during the colder weather. I love boating and grilling in summer. my favorite thing about summertime is walking with my son and our two dogs down the local trails through the woods. We love it. my favourite thing about summer: heading out to the beach with my friends! My favourite thing about summer is how long we have daylight for! I love the sun! I love the time to spend with my family, on interests, and outside. I get the summer off so summer is really relaxing. My favorite thing about summer is swimming. I so look forward to a refreshing swim in a beautiful lake, pools are just not the same! My favourite thing about summer is wearing flip flops and not having to wear a jacket. My favourite thing about summer is... getting to go on vacation and visiting new places all around the world! Summer is the time for BRIGHT lipsticks, love my corals and fuchsias! my favourite thing about summer is patio time!!! My favorite thing about summer is the smell. It's sweet and flowery. Favourite thing about summer is the heat and exploring the beach. I love getting a tan. It means I can hold onto summer a little bit longer when the weather starts to get cool and dreary. Awesome box, Ellesy! Thanks for the opportunity to won this box! My favourite thing about summer is being able to play beach volleyball everyday. My favorite thing about summer was the summer weather! I loved the hot weather and getting to play in cold water. Now, its the fall and its super cold!! I love all the things you can do outside! Like all of the fairs and barbecues. I love being able to go outside without having to put on a coat or boots, and I loooove waking up to sunshine! My favourite thing about summer is the beach! I love the longer days! Thanks for the giveaway! My favourite thing about summer is getting a tan! My favorite thing about Summer is reading outside! I love all the great summer salads! I love lying in the park on Sundays listening to free outdoor concerts. Currently, I'm a student so my favourite thing about the sumer is the break I get to have.